Warner Bros have unveiled their first official poster for Steven Soderbergh's upcoming thriller Contagion, which opens in conventional & IMAX theaters this September 9th. The director has amassed an impressive cast for the viral thriller including Matt Damon, Kate Winslet, Marion Cotillard, Jude Law, Gwyneth Paltrow, Laurence Fishburne, John Hawkes, Josie Ho, Demetri Martin, Jennifer Ehle, Bryan Cranston, Elliott Gould & Sanaa Lathan. The World Goes Viral September 9th. Hit the jump to check out the poster. "Contagion follows the rapid progress of a lethal airborne virus that kills within days. As the fast-moving epidemic grows, the worldwide medical community races to find a cure and control the panic that spreads faster than the virus itself. At the same time, ordinary people struggle to survive in a society coming apart." 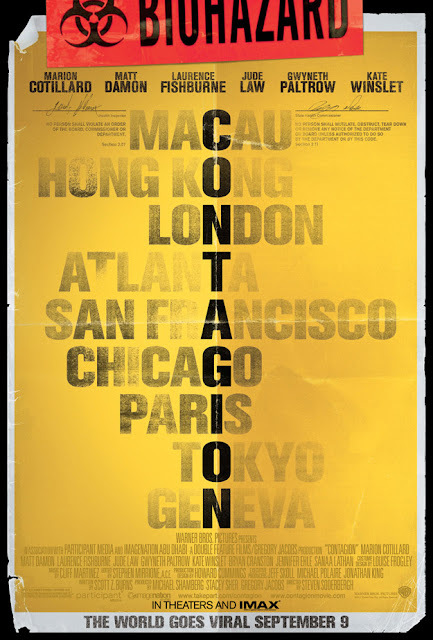 I'm reading: The World Goes Viral In Warner's First Official Poster for STEVEN SODERBERGH'S 'CONTAGION'Tweet this!